But the man wanted to show that the way he was living was right. So he said to Jesus, "But who are these other people I must love?" 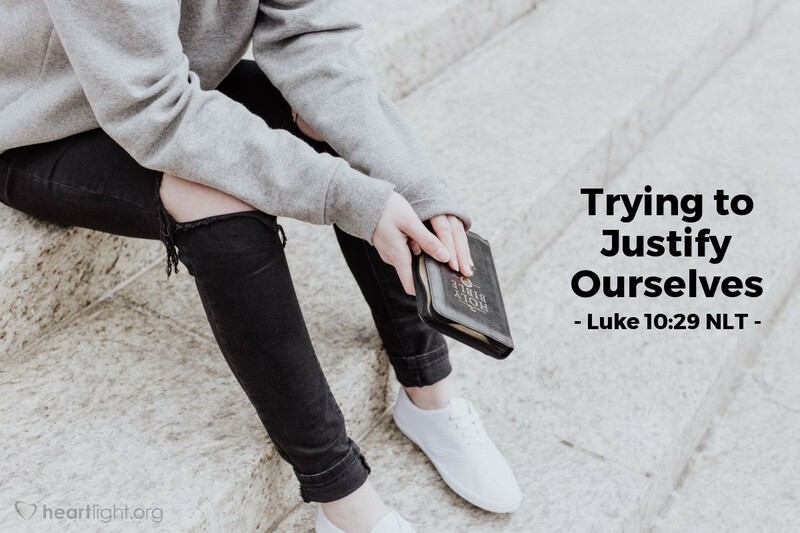 So often when the conviction of God's word strikes our hearts, we try to justify ourselves rather than simply throwing ourselves on the mercy of God and changing our hearts and lives. If the expert who had come to test Jesus had honest motives, Jesus' question, affirmation, and reply would have been enough. But, the expert wanted to look righteous more than he wanted to be righteous. How many times does this pattern of behavior reflect you? Let's realize that we cannot justify ourselves, but can find our righteousness only in God's grace given to us in Jesus Christ. Then let's go out and seek to live his life in the world as we are supplied by the power of his Holy Spirit! God, my heavenly Father, forgive me for trying to make myself look righteous when that gift comes only from you. Forgive me for my religious posturing that has kept me from opening my heart up completely to your grace and from living my life in honor of that grace. In Jesus' name I pray. Amen.